The unique and cute traffic lights - many visitors to Berlin must remember these iconic characters. How impressive are they? Enough to reach Tokyo. Shibuya, one of the busiest areas in Tokyo, the second Tokyo Ampelman Shop opened here in April following the first in Shirokane-Takanawa, which opened in 2010. Tokyo is very diverse and the main shoppers in these two stores are different – In Shibuya the majority of customers are women in their 20’s and 30’s whereas the store in Shirokane-Takanawa – supposedly a higher class area – has more variety, attracting men and women in their 30’s–50’s. But the similarity between the two is that most shoppers are huge fans of Ampelman and are pursuing something cool which is not yet too popular. Although Shibuya has always been typically popular with the youth, it is attracting even more people now due to the recent improvement of railway connections to the city. This is why the second flagship shop was opened in this area. Close to the start of Cat Street, a sidewalk famous for small fashionable shops and restaurants, the colourful façade of the Ampelman Shop Tokyo Shibuya and the cute characters catch people’s attention. Once you step inside the shop, friendly staff greet you with an “Irasshaimase” (“welcome”) and a smile. 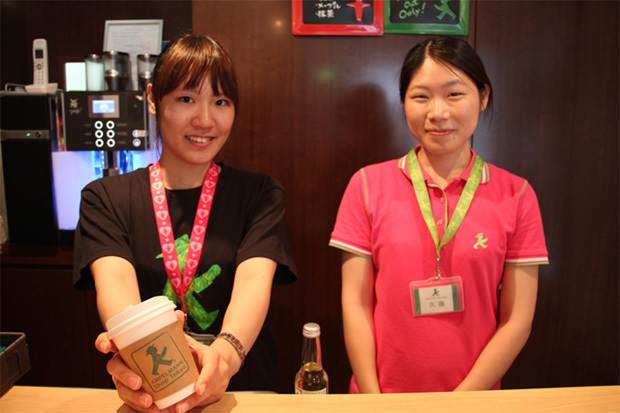 Kanae Kubo (right), a store staffmember, decided to work at the shop because she has been interested in Germany since she studied about the country in a seminar during her degree course. She looked happy when she described sensing the history during her visit to Berlin where the atmosphere totally enchanted her – for example the Berlin wall, monuments and bullet holes left in buildings. 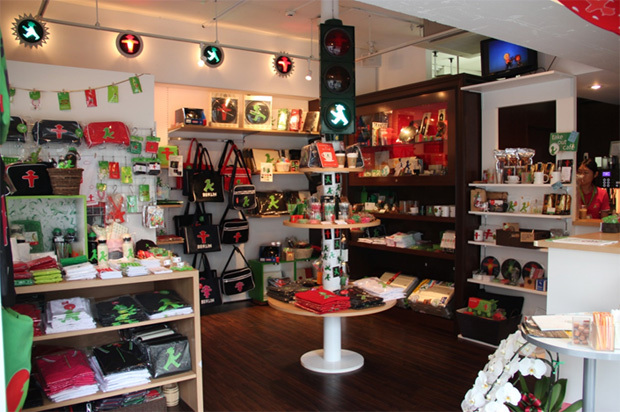 The shop’s symbol is a traffic light which is placed in the middle of the store. The fact that the traffic light is imported from Berlin has been surprising visitors and stimulating communication between shoppers and staff. 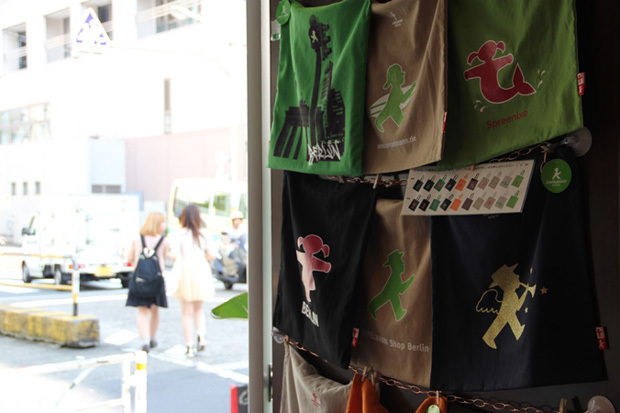 For this second flagship shop in Shibuya, reasonably priced items such as eco bags and safety reflectors sell well to girls. However, frequent users are not only trend-conscious girls and big fans of Ampelman, they also include those who travelled to Berlin and forgot to buy enough souvenirs. They secretly visit this shop to compensate for the shortfall. So the Ampelman Shop Tokyo can help Tokyoites when they miss a gift from Berlin for a friend – Of course the staff members are kind enough to peel off every Japanese label before wrapping the gift! 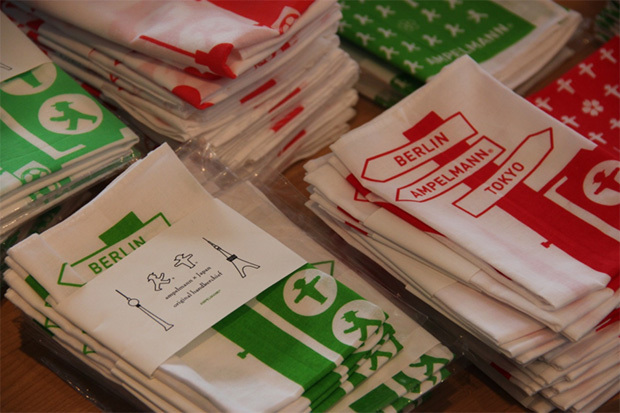 Adding to the goods from Berlin, Japan limited Ampelman items, such as small towels, Japanese hand towels (Tenugui), phone charms etc. are available. These Japanese versions of Ampelman products have been purchased by visitors from Berlin as souvenirs from Tokyo as well. 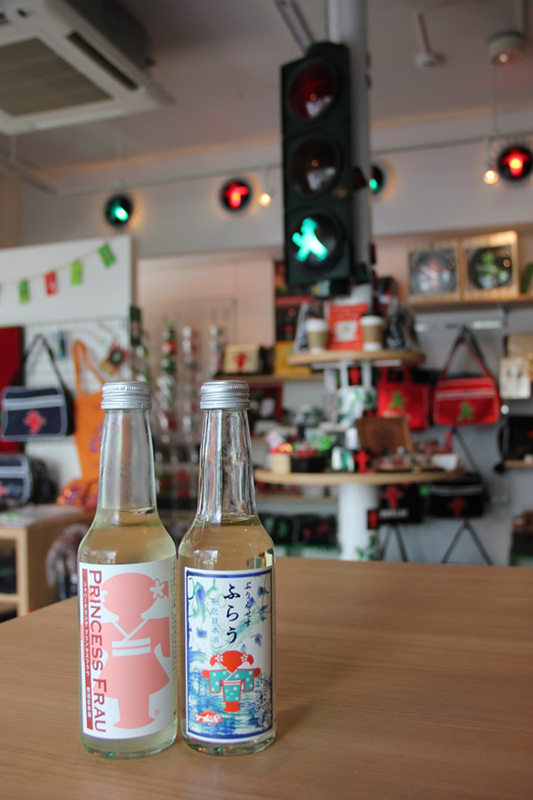 The most Japanese-like product would be Ampelman sparkling Sake: “Princess Flau” (written in the Japanese alphabet on the label), made in Tsuwano, a sister city of Bezirk Mitte, Berlin. It has a light, fresh and fruity taste at first and leaves the sweet smell of rice. 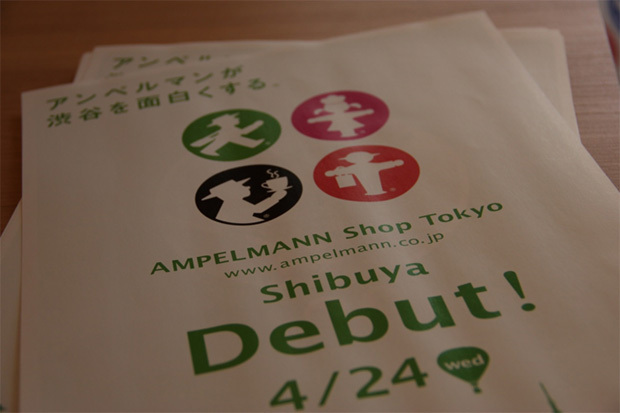 Ampelman shop Tokyo collaborates with Tsuwano city closely because Ogai Mori, a famous Japanese writer who used to live in Berlin is from this city. 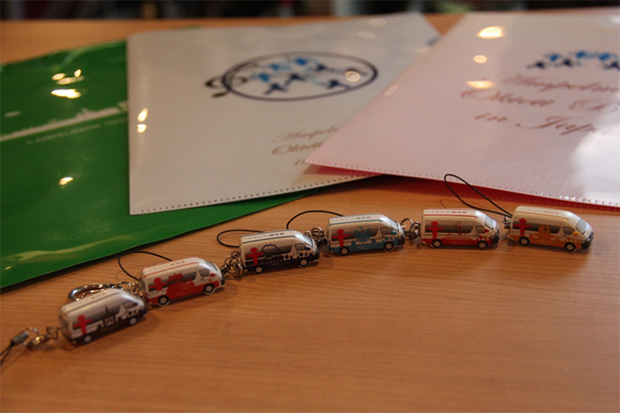 The city runs Ampelman vans as a tourism promotion and Tsuwano versions of Ampelman items are available too. 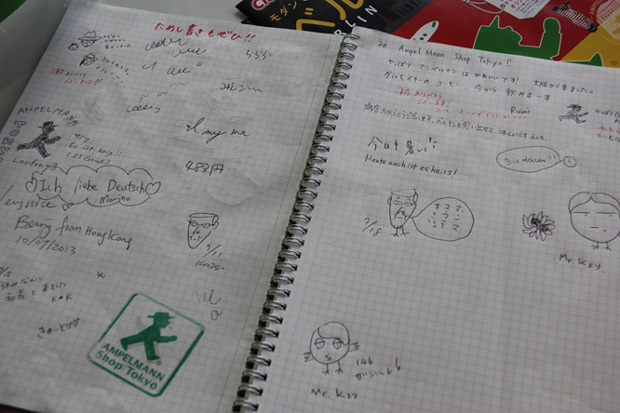 “We hope to promote the city of Berlin via Ampelman to Tokyoites. 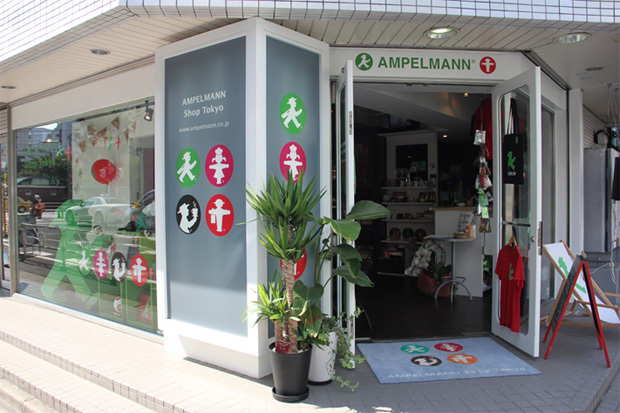 Visit us when you come to Tokyo” says Ms. Kanae Kubo the store staff – Ampelman shop Tokyo has been welcoming more and more shoppers as Ampelman becomes more popular in Japan. If you look carefully, Japan limited Ampelman goods might be around you. From and lives in Tokyo. An English – Japanese interpreter/translator. Interested in international affairs and studied international relations in UK. Loves travel and photography.